Barrels are stored right on site at Cardinal. "Are you making whiskey yet?" It's a question that we field every day. We've already made White Oak Whiskey, an un-aged single-malt from 100 percent Indiana-malted barley. But, of course, we know what you're getting after: Where's the aged stuff? We hear you. We're anxious, too! Here are the answers to questions we get asked most about our whiskey. Have more? Just ask next time you're in. Jason and Doug filling whiskey barrels at the distillery. Q: Are you making whiskey yet? A: Yes. We have both bourbon and single-malt barley whiskey aging in barrels. A: We hope to release some of it in time for the holidays. Q: Where are the barrels aging? A: Right here at the distillery. We'll show you when you take a tour. Q: What are you aging it in? A: We're aging the bourbon in charred, new American oak barrels. The single-malt barley whiskey is in toasted oak barrels. 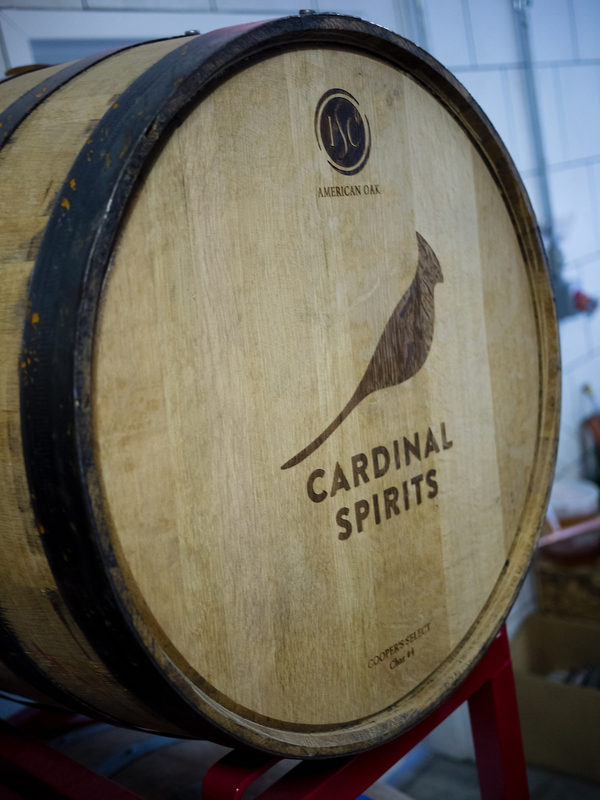 That's Cardinal co-founder Jeff Wuslich checking on the contents of the barrels using a whiskey thief, a tool that pulls out a small sample. Q: Where do you get your grain? What's the grain bill? A: We source from independently-owned providers in Indiana including Glick Seed of Columbus and Sugar Creek Malt Company in Lebanon. The bourbon is 60 percent corn, 20 percent malted barley, 10 percent rye and 10 percent wheat. And it smells incredible. The single-malt is a blend of 2- and 6-row barley. Q: How much is a bottle going to cost? A: The price hasn't been set, but it's going to be competitive. What would you guys pay? Q: What's it going to taste like?